Fantastic review! This sounds like a very helpful book. Thanks for the introduction. I've heard the myths about only children and I've always wondered whether they are true. I think it can definitely be a smart decision considering today's times and college expenses. As a teacher, I would find this really interesting. It sounds like it came along at a good time for you. For what it's worth, all of the myths about only children are in my experience (of teaching, don't know about home life), just that, myths. Some only children don't know how to relate to other children but others are more outgoing and make closer friendship bonds than those with siblings. I hope your family turns out whatever way you want it to. My mom was an only child and threatened to drop off a baby on my doorstep if I didn't have another child on my own after my first. I think she led a lonely life growing up and took so much of the pressure of her parents' expectations on. But I really think that had she had younger parents, perhaps parents that hadn't already had a stillborn, things might have been different. I think an only child can have every bit the same kind of life as a child with siblings, in many cases better. Don't you just love it when a book falls into your hands at precisely the right moment?! I'm so glad this book found you when it did, and that you took something useful away from it. Thanks for being on the the tour! 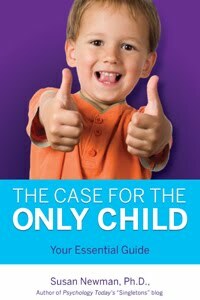 Sounds like a useful book for parents. From my experience, most of the assumptions about only children are untrue. Whatever you decide, be comfortable with it, regret is a hard thing to live with. Kids and college are expensive, but where there's a will there's a way.